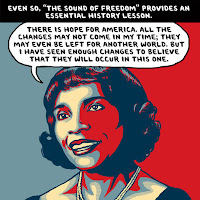 * On Easter Sunday in 1939, contralto Marian Anderson, one of the most celebrated singers of the 20th century, gave an electrifying concert at Washington’s Lincoln Memorial. The controversy surrounding this groundbreaking performance by the African-American artist -- one of the seminal moments in history of the civil rights movement -- is revealed in Ray Arsenault’s The Sound of Freedom: Marian Anderson, the Lincoln Memorial, and the Concert That Awakened America . Now, if you're one of those types that likes lots of pictures in your books, Ward Sutton's interesting review of this book, as well as the historic event and the circumstances surrounding it, is definitely for you. The picture above right is from Sutton's review. Ward Sutton’s cartoons and illustrations have appeared in the Village Voice, TV Guide, Rolling Stone, Time, Esquire, The New Yorker, and on the Op-Ed page of the New York Times. * You'd have to have been hiding under a conductor's podium to not have heard about the new and improved Alice Tully Hall. Unfortunately, as per usual, there is a good deal of controversy brewing about the hall. Why? There is a gaping hole where the pipe organ, purchased by Ms. Tully herself, should be. The pipe organ is still sitting in storage in upstate New York. It would seem that many are simply looking the other way and hoping people will forget about it. Kerry A. Madden, Lincoln Center’s vice president for concert halls and operations is quoted in the New York Times as saying: “We’re trying to juggle a number of issues.” He said the goal was to return the organ to the hall, which has a space waiting for it, in the summer of 2010. Allegedly, officials were trying to find a time to schedule the installation... but... he acknowledged that there was no money budgeted for its return. Something's a little fishy. * A new magazine revolving around classical music is on the shelves. Listen: Life With Classical Music, is the first general-interest classical magazine published in the United States since the 1992 demise of Musical America, which exists in an online form. “LISTEN celebrates our community and offers a closer look at some of its artists and citizens,” says Editor in Chief Ben Finane. “In our March/April launch issue, classical musicians Isabel Bayrakdarian, Danielle de Niese, Joyce DiDonato, Leon Fleisher, Hélène Grimaud and Alexandre Thiraud share their thoughts on music and life.” Finane has organized the magazine into sections called “Music & Life,” “Discovery,” “Recommended” and “Remembering.” The premiere issue also includes a spotlight on Seattle’s music scene and fifteen questions for Met Opera impresario Peter Gelb.